I pulled out a bunch of paper packs to show my son so I could pick a style for his teacher thank you card. I figure teachers are people too and probably get tired of teacher-y themed cards. He has no idea which style best suited her but chose 7 Gypsies papers for this card. He thought she would like the butterflies. Not much to explain about this one. Lots of inking and distressing. 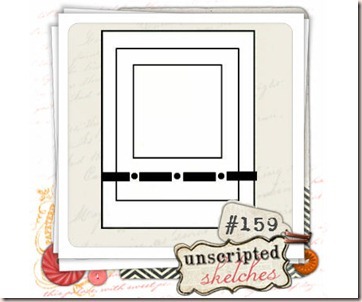 I used Unscripted Sketches #159. Click on the sketch to visit the challenge. 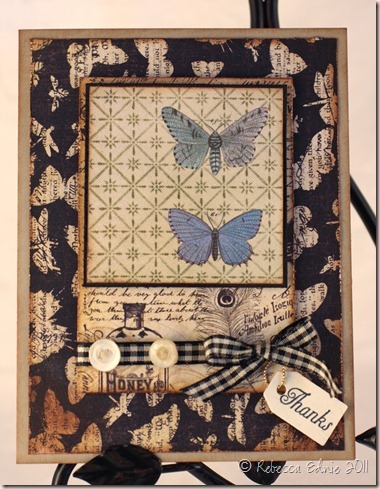 Ink: Memento black, Antique Linen, Vintage Photo Distress, kraft, vanilla, black CS-SU! Oh wow this is just gorgeous – what a beautiful card! Thanks for playing at Unscripted Sketches!